Homesteading is still very new to us. We have dabbled with a garden or clothesline, making bread from scratch now and then, or cloth diapers for a short period in the past. However, now that we own a home and decent sized backyard, we are going for it on a whole new level of being sustainable and getting back to the old ways as much as you can in a suburbia. We are in an agriculturally based town and county. There are, literally, chickens everywhere, especially WinCo and IHOP parking lots because they are watered and fed so well over there. And here I am raising hens and growing fruit trees when I’m in the middle of chicken and walnut town. However, some of the reasons I do this are beyond saving money or being frugal and clever, it’s about global change on a local level. It’s about climate change and our societies overall consumeristic lifestyles, the all-consuming drive for money and success and the falling away of all the truly important heart and soul foods such as family, neighbors that know each other and care for one another, mothers or fathers that are home with their children, homemade food that isn’t loaded with chemicals that are making us sick, autistic, and fat. I could go on. I’ll spare you and set my soapbox aside. I’ve only begun the book with some skimming but I believe she is based out of the bay area. 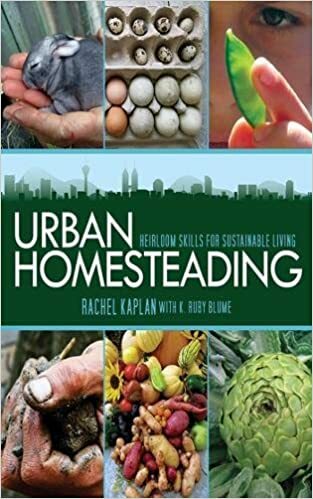 She talks of huge movements going on all over the world and right here regarding urban farming and homesteading. In short, I feel that doing a farm in a city or town, in a suburban neighborhood or downtown neighborhood is bringing real life to an artificial setting. For me, and I really should only speak for myself, Homesteading is in many little activities, not just farming and raising animals. It is in drying clothes outside, in homemade food, in practicing reusing, recycling, and in being as green as possible in the home. I now make 90% of my food from scratch. I feel good about that. I feel good about what my sons eat and I see how clear their eyes are, how healthy and vibrant they are daily. I see other children that my son plays with and they can’t seem to keep up or run as far without pooping out. They are usually kids raised on junk food and processed meals from boxes. I also love working in the kitchen making this food for my family. I know that my sons will remember how their mother would make bread during the week or rolling out tortillas as a pot of beans simmered on the stove. They’ll remember yogurt being made in the mornings just as Bali recalls his mother making yogurt and Atta in his childhood. I really enjoy my gardens and trees and hens. I’m busy during the mornings outside in the sun and fresh air. I hear the birds and neighborhood dogs, the train just outside of town. I talk to my girls (hens) and feel excited when one of my garden beds springs up green overnight. My children like looking for eggs and watering the lettuce. They are learning about the environment, Mother Nature, and how to grow fresh food. As they learn to grow the food, make the food, so they enjoy eating it more and more. They do not eat nor will they ever eat like the typical American. Arjan is 5 years and he watched some gardening video’s on YouTube with the Vegan Athlete yesterday. He really enjoyed them and watched a good hour or more with me on how to make a rich soil and what to plant in the fall. He is into it. Sammy is 3 years asked me today if his poop was good for my garden. We had a talk about only certain poops being good for the soil. Chicken and horse are great. Boy and dog not so much. I like that they are thinking about this stuff. We spend our lives mostly at home. Yes, we do go to Nevada City up the way and roam the forest. Yes, we do spend time with friends and family, we just had an aunt visit for two days. We go to visit the boy’s godparents, they are cherished souls and so we make time for them. Other than that we don’t drive much. We have a whole world in our little cottage and little backyard farm and it keeps our lives full and busy. We know our neighbors, at least most of the street and we chat with them over the fence and have them for dinner sometimes. We live in a way that was gone 70 years ago but it’s coming back in full force. The more I read and explore, the more I see that there is a huge movement toward getting back to a simpler, slower way of life, reconnecting with nature through organic farming or permaculture. There are Transition Towns and urban farmers popping up like crazy all over the place. Even bartering and trade is coming back and skills that our great grandparents had are being relearned again. We are only beginning this adventure and I have to remind myself to not rush, not be disappointed when things aren’t working fabulously. Sometimes I plant a bed and all my greens come up only to disappear in the heat. My hens started out giving 4 and 5 eggs and now we get 2 a day. We have had to replace a few trees and I don’t think we planted everything correctly. I’ve tried to put garden beds on our paved part of the yard and it was too hot and unsuccessful. We have had our cat turn a bed into a cat box and had to build fences. I thought my hens were young and it turns out they are close to retirement in chicken years. I had raw tortillas for a dinner and bread go flat. I’ve ruined two batches of homemade yogurt even though I was already a pro at it before and used to make the best yogurt but now I’ve lost my touch. Broccoli isn’t coming up but spinach is doing great. My chickens are now running wild and still not producing much but they keep the boys busy and fertilize my land, eat bugs, and til the soil around my strawberries. I have a success and two failures. I just keep reading and researching. I’ve joined garden groups online, self-sustaining groups, chicken groups. I ask questions daily. I keep building and planting and moving forward. Once I master a section of my self-trained farming, I move on to the next project. We just started all this a couple months ago and I feel like it’s been years. It keeps me busy and, although we may not be able to feed our family off our land this year, soon we will enjoy many homegrown gifts. The biggest benefits are a more wholesome lifestyle, a bit of self-sufficiency, and creating an ecosystem in our yard that supports nature, birds, bees, and humans. What a way to serve God. Previous Home sweet home. Taking care of the house you have and taking pride in being a housewife. Next Becoming vegan. How to love every bite. I know! I see the beginnings of a book as well. Just do it! I think our society would be SO much happier going a bit back to the old ways. Gardening and biking or walking everywhere, moms (or dads) at home…it makes for happy and healthy families. That Redneck! As a child I raised a wonderful bed of carrot tops! The carrots themselves were a failure but what verdant green above ground! That is a charming story. It sounds like something I would do now. Thank you. I would live like this if I could. Almost impossible for us to buy a house in town, thus we’re raising our five kids (til now) in an apartment. My husband’s parents live in the country so we bring food produced with their (bio) ceaseless work, and I’m very grateful for this. Here in Romania most women cook from scratch, kids still go outside to play, I reuse clothes, use the electric drier only when it’s very cold or rainy, we have a simple living, but my heart aches for a little cottage. A maximum of three bedrooms I long for 🙂 We currently have two. two is hard for a family of 7. We are all squeezed into one room as Grannie has the other bedroom. Our house is very small but I don’t mind that. I hope you find a cottage with some land. Do you blog? I would love to see into your days. Two bedrooms and a living room with an open space kitchen. 5th floor in a block of flats. I like our nest, would like to have it on a piece of land with one extra bedroom 🙂 I don’t blog, maybe I will some day. That’s not much to ask. I hope this becomes a reality for you. backyardchicken.com and something else. It’ll be in a future blog. There are hundreds. It’s fun! Hi Kate! I am loving your book! I’m almost half way through. As soon as I get home from work at night I’m reading and before! I just love all you write and it pushes me to want and do better. I’ve always been thrifty and frugal. I had a couple of questions. Since I blog from my phone I just ordered one I haven’t gotten it. Its a cheapy I have to do everything for my blog from my phone. Hopefully I can pair it with my Kindle but I purchased an office writer app fpr my kindle I think it was 1.99 and it has all the office programs van I write my book in this and upload it to KDP I do have my desktop but no internet at home. I just wote a blog and hope I didn’t lose it this phone jumped out of it! Grrrr and does it all the time! Found a cheap washer and I’ll always have my clothes line the old metal good kind. It had a couple gliches ubby (jack of ll trades) figured t out works great! This sphoto big! Much needed! I love it. Your books Kate have lifted my spirits so much during these times were going through. I can’t say enough dearly! Please know how you lift me up and inspire me and have gotten me through some of my darkest days lately! Tell Joette Hi and that your making her famous! Lol have a blessed day my friend! You have been blessed with a gift! Thank you for everything and Evelyn to! Love her! I write on a laptop and couldn’t even imagine writing on a phone or iPad. It’s the way I have to write now. I just posted a blog and wrote about your books to and how much I love them! BecauseI do! Off to tidy and laundry, laundry. God bless dear! Have a joyful day! That boxed food has no nutritional value, it doesn’t feed their growing bodies. Grannie is dealing with that and her daughter and grandsons terrible diet. Great post! We just started our homesteading adventure in the city. We have chickens for now and hope to start intensively gardening in the spring. Our issue is our entire lot is covered with trees so shade is everywhere. We are considering shade-type food-producing plants. I have to constantly tell myself to take one day at a time and to think of it as a journey not just a destination. I read that the first year is basically for experimenting. By the third year you start having some success. I have to remind myself to relax as well. Both my gardens were not big successes. The soil, bugs, that darn squirrel. I had a chicken die recently for no apparent reason (I tend to them like loved pets). They also say (I read a lot of backyard farming books…that is who they is) to start small and grow slow. As for trees, watch TheVeganAthlete and others on Youtube to learn about growing food forest. I’m learning that myself since we planted fruit trees everywhere and now I want to garden everywhere as well. Thanks for the advice! I watch Abundant Permaculture on YouTube. Justin Rhodes has been a big inspiration of mine. I just bookmarked that one. Thank you for sharing. Always looking for new farmers and advice. Would love to see your progress. 🙂 Are you going to share it on a blog? People would love to be inspired by this sort of thing. Just checked it out, love it! I tried to join but can’t seem to figure it out? I’m not sure. Sorry, still new to WordPress! I’m glad you like my blog!